Hance called Leach and suggested three things that would put James's complaint to rest: pay a fine, perhaps as much as $60,000; apologize to the James family; and sign a statement saying that he would not punish anyone under a doctor's care. "The main thing is we wanted him to apologize," Hance explained. But Leach had no intention of paying a fine or apologizing. "I'm not going to do any of those things," he told Hance, "because I haven't done anything wrong." Hance felt Leach was being unreasonable and suggested he give serious consideration to acting on his recommendations. "Well, if I don't do it?" Leach said. "I'll probably have to terminate you." Up to that point, Leach hadn't sought any legal advice. The bowl game was a week away, and his focus had been solely on Michigan State. But after hanging up with Hance, Leach called his attorney. After graduating from the law school at Texas Tech, Ted Liggett went to work for a small firm in Lubbock. He ended up representing lots of Tech student-athletes who had issues with eligibility. He also represented the athletic department during numerous NCAA investigations. When Leach arrived in 2000 Liggett became his personal attorney. They were polar opposites politically. Leach is conservative; Liggett a far-left liberal. But they became fast friends. Liggett had never attended a Tech football game until Leach became his client. Before long, he never missed a game. Leach gave him a sideline pass to every home game. It was late in the afternoon on December 23 when Leach reached Liggett at home. "I might have a problem," Leach said. "What's going on?" Liggett asked. Leach brought him up to speed on the incident and the investigation. Liggett was familiar with all the players. He had known Charlotte Bingham for more than twenty years. He was on good terms with Hance and Myers, and Bailey was a close family friend. After an initial conversation with Charlotte Bingham, Liggett called Guy Bailey. They both felt they could resolve the matter and agreed to meet the following day—Christmas Eve—at Bailey's office. Bailey said he'd make sure Gerald Myers attended, and Liggett agreed to bring Leach. But a blizzard hit Lubbock on December 24, pushing the meeting to the day after Christmas. The delay gave Bailey plenty of time to think through the situation. Bailey liked Leach a great deal and admired the excitement his coaching style had brought to Lubbock. He and his wife, Jan, went to every home game. They had even gotten to know many of Leach's players on a first-name basis. It was Bailey's sense that Leach and his players had a strong bond and that the incident with Adam James was an isolated one, not a systemic problem. Nonetheless, Bailey was uncomfortable with the way Adam James had been treated. The dangers of concussions among pro football players were starting to attract national attention. That fall Congress had convened hearings on head injuries in the NFL. Public awareness around sports-related brain injuries was starting to pick up. Bailey felt it was only a matter of time before the NCAA faced similarly difficult questions about whether member institutions were adequately addressing the risks associated with concussions in football. Over the weekend, Bailey had drafted a letter that he hoped Leach would sign. He and Myers planned to present it to him at the meeting. There was one problem: Bailey had no idea that Hance had already called Leach and given him an ultimatum. Hance hadn't told Bailey. When Liggett and Leach arrived at Bailey's office, Bailey asked Liggett to wait in the reception area. "We want to meet with Mike alone," he said. Leach entered and took a seat opposite Bailey and Myers. "We're here to help you, Mike," Bailey began. "We want to work through this and get to a solution." Then Bailey handed Leach the letter and asked him to read it. As you know, we have been conducting an inquiry into allegations by a student athlete that your treatment of him, subsequent to his being diagnosed with a mild concussion, may have been injurious to his health and served no medical and/or educational purposes. All practices and team meetings would be monitored by the athletic director. All injured players had to be cleared in writing by a physician before being eligible to practice or play. Leach had to acknowledge an obligation to treat student-athletes with respect. Leach had to treat all student-athletes at all times in a fair and responsible manner and cease any actions not in compliance with his employment contract. Leach would not retaliate against any student-athlete who suffered an injury. "Well, I already do these things," Leach said. "They're in my contract." "Mike, if you will sign this letter and make an apology to the James family," Myers said, "we will get this situation behind us." "Listen," Leach said, "if you don't want me here, let's negotiate an exit strategy and I'll leave." "There's not any reason to talk about that," Myers said. "We have no interest in that." "I will find another job," Leach continued. "And you can hire somebody that you're more pleased with. But you're not going to railroad me with false charges." "Look," Bailey said, "concussions are a serious issue. It needs to be addressed. It can be addressed through an apology or some kind of letter of explanation that shows you were doing what you felt was in his best interest or welfare. But somehow we have to demonstrate that we had the welfare of the student-athletes covered." "First of all," Leach explained, "Adam James was treated as if he had a concussion. Two, I did the same thing with Adam James that I did with other injured players: I told the trainer to handle him. Did I tell him to get him off the field? Yeah, I told him to get him off the field. "He had him stand in the garage," Leach continued. "I found out half an hour later that this is where he had him stand. I don't have a problem with it. But since when have I ever commanded a trainer or doctor to do anything? Nor do I have the ability to. They don't answer to the head coach. They answer to the assistant AD." Bailey repeated that he simply wanted Leach to explain that in writing. He then asked Leach to step out and send in Liggett. When Liggett came in, Myers handed him the letter he had prepared for Leach. Liggett wasn't surprised that Leach had refused to sign it. "I don't think he thinks he's done anything to apologize for," Liggett told them. Bailey said he understood that and made clear that he wanted Leach to remain the head coach. But the university needed something in writing from Leach. Otherwise, it was going to be very difficult to prevent the situation from going public. Then all bets would be off. While Bailey and Myers met with Leach and Liggett, Kent Hance was communicating with Craig James. "Mike Leach's actions with Adam were inhumane and dangerous, designed to inflict punishment and create great mental anguish," James wrote in an e-mail. "Action must be taken to not only insure the safety of Adam but to protect his teammates from this and other forms of abuse Coach Leach inflicts on his players. "Kent, I ask you and the board members this: Have each of you seen the shed and electrical closet Adam was confined to? I'd recommend each of you visit the places—walk in them and turn the lights off. NOW, imagine standing there for three hours in the cold without being allowed to sit down or lean against the wall. This story will become public at some point and you can count on the fact that some television cameras will show this picture." The regents were getting antsy, too. So was the university's legal team, led by general counsel Pat Campbell. In consultation with the lawyers and the trustees, Hance told Bailey and Myers that they needed a letter from Leach by noon on Monday. In the back of his mind, Liggett was convinced that Leach was going to have to make some kind of concession to get the problem behind him. But he was hoping to delay any action until after the bowl game. He called Charlotte Bingham, updated her on the meeting with Bailey and Myers and said he would continue to work toward a resolution. The following morning Liggett got a voice mail from Bingham. "Hi, Ted. This is Charlotte. Sorry to call you on a Sunday morning. I did want to touch base with you. Actually, after our conversation last night I did visit with both the chancellor and the president. Here's where I think we are. One, a number of . . . things just keep happening in terms of . . . let's just put it [at] outside pressure. And so what I really think needs to happen, if there's not just some incredible objection Mike needs to sign the letter that he . . . sign the letter that he was presented with. Return that to . . . return it to Pat or return it to the president, and then he needs to work on some sort of apology. And also the chancellor would like you to get that either to the president or to Pat on Monday." Reading between the lines, Liggett determined that the reference to outside pressure was code for Craig James. It was Sunday night before Liggett reconnected with Leach and told him about Bingham's voice mail and the Monday deadline to produce a letter of apology. "If you don't sign the letter, Kent is going to come after you," Liggett told him. "Yeah, well, I'm not signing it," Leach said. Once Leach left for San Antonio without providing the letter, Gerald Myers told Guy Bailey he planned to suspend Leach. Bailey pledged his support. "Our hope," he explained, "was that the suspension would send a strong enough message that we really had to have the letter." The responsibility to inform Leach fell to Myers. Sharon Leach had invited practically every relative on both sides of the family to the Alamo Bowl. As soon as Mike and Sharon reached the hotel room, she started calling family members to double-check arrival times. Her ten-year-old daughter, Kiersten, and thirteen-year-old son, Cody, were unpacking. Mike went off in a corner and began scribbling notes for the team meeting scheduled for later that afternoon. It was roughly 2:00 p.m. when his cell phone vibrated. It was Myers. He didn't bother with pleasantries. Sharon immediately knew something was wrong. Mike was pacing with the phone to his ear. "Why?" he finally said, breaking the silence. The kids looked at Sharon. "None of it's been proven," Leach said to Myers. "And it didn't happen." Sharon put her arms around Kiersten. "Who is they?" Leach said. There was another long pause. "I'm not signing a letter that said I did something I didn't do," Leach told Myers. Myers was through talking. "Mike, the administration, the board, supports this. It's a done deal. You're suspended." Leach hung up and turned to Sharon. "I've been suspended." Sharon covered her mouth. The in-laws had just landed at the airport. They would be at the hotel soon. "What do we do now?" Sharon asked. Ted Liggett never expected Tech to suspend Leach. Not after he and his family had flown to San Antonio. Not on the eve of a bowl game. Not when they had a strong ally in Guy Bailey, the university's president. Liggett quickly ran through Leach's options. One was to simply sign some sort of apology letter. Another was to ask a judge to issue a temporary restraining order (TRO), effectively freezing the suspension until a full hearing could be held to determine whether the suspension had merits. The chances of getting a TRO, Liggett believed, seemed pretty strong. Leach's contract gave him a ten-day cure period for any disputes pertaining to employment. But Liggett couldn't help wondering how Tech officials would react if he took them to court. They might just fire Leach. He called Leach and gave him his options. Leach held his ground. He wasn't signing the letter. By the evening of the twenty-eighth, speculation was rampant among the Lubbock media about the identity of the player who had accused Leach of mistreatment. But by the following day, it was a national story. Craig James's ESPN colleague Joe Schad named Adam James. So had the Associated Press. Shortly after the ESPN story broke, Kent Hance heard that Ted Liggett planned on asking a judge to block the suspension. An emergency hearing had been scheduled for the following day. It was hard to predict how a judge in Lubbock might rule. But there was no question what the court of public opinion in Lubbock thought. Fans and alumni were in an uproar. They wanted Leach back. They wanted Adam and Craig James jettisoned. And they wanted Hance and Myers fired. Bailey felt as if the situation were spiraling out of control. "The whole purpose of the suspension was to get Mike to work with us to resolve the issue," Bailey said. "When it became clear that that wasn't going to happen, we had two choices: either we say we really didn't mean it, or we take the next step." While Texas Tech officials figured out the next move, Craig James gave his PR firm permission to post Adam James's cell phone video on YouTube. Spaeth sent out an internal e-mail to some of its employees, encouraging them to take steps to help the video go viral. That same night, Craig James was in San Diego preparing to provide color commentary for the Holiday Bowl. Before the game he did an interview about Leach's actions with ESPN's Steve Levy on SportsCenter. "ESPN made me go on the air and do the Steve Levy interview," James said. "They said, 'We won't let you announce the Holiday Bowl if you don't address this. You've become the news. If you want to work the game, do the interview.' [It was] the hardest interview of my life." On the morning of December 30, television satellite trucks were in front of the district court building in Lubbock. Reporters were outside. By 9:00 it was standing room only in the courtroom. The gallery was packed with Red Raiders fans, none too happy. Tech sent a team of lawyers, led by general counsel Pat Campbell and deputy general counsel Victor Mellinger. Judge William "Bill" Sowder wanted a word with the lawyers in his chambers before starting the hearing. "Is there anything I need to know before we go out there?" Sowder asked. "I don't like any surprises." "Well, Judge, there is," Campbell said. "Even if you grant the TRO, we're not going to let him coach." "So what are you saying?" Sowder asked. "The decision has been made to terminate Mike," Campbell said. He reached into his jacket pocket, removed a letter and handed it to Liggett. This letter shall serve as formal notice to you that, pursuant to Article V of your Employment Contract, you are terminated with cause effective immediately, for breach of the provisions of Article IV of that Contract. That was it. One sentence. Tech's president, Guy Bailey, had signed it. Liggett handed the letter to Sowder. He read it and handed it back. "What do you want to do?" Sowder said. Liggett asked for a moment. He stepped into a private hallway and called Leach at his hotel room in San Antonio. "Mike, they fired you." Leach was reserved. "Yeah, well . . ." His voice trailed off, then he just quietly hung up the phone. Sharon Leach didn't need to ask what happened. She knew. And as soon as Mike and Sharon started packing their suitcases, the kids figured it out too—Dad was out of a job. Mike and Sharon returned to Lubbock just long enough to pack a week's worth of clothing. Then they took the kids and headed to the vacation home they had purchased in Key West a year earlier. By the time they arrived, Craig James had authorized his PR firm to give the video Adam James had made of himself in the closet to CNN, along with permission for CNN to broadcast it on all its networks and affiliates worldwide. "We wanted to prove, to show that our son had been confined, ordered and confined twice to be by himself," James said. Meanwhile, Leach sued Tech for wrongful termination. After a week in Key West, he and Sharon decided not to leave. They enrolled their kids in a school on the island, purchased four bicycles for transportation and began the process of trying to figure out what to do next with their lives. "Mike had been in coaching forever," Sharon said. "The hardest thing about living in Key West was not having a team. All of a sudden we were all alone." 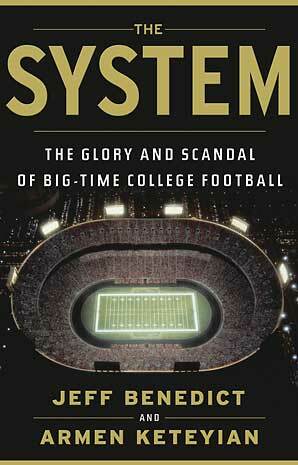 To purchase a copy of THE SYSTEM, go here.